Activists at the Towards Zero Together march in Amsterdam. Photo by Liz Highleyman. Most supervised drug consumption facilities offer hepatitis C virus (HCV) testing and referrals, but very few offer treatment, indicating that they could potentially play a greater role in curbing transmission and negative health outcomes related to hepatitis C, according to research presented this week at the 22nd International AIDS Conference (AIDS 2018) in Amsterdam. HCV, hepatitis B virus (HBV) and HIV are readily spread through shared drug injection equipment, and people who use drugs have high rates of these infections. Drug overdose is also a growing concern, worsened by the introduction of fentanyl and other opioids that are much stronger than heroin. The advent of highly effective and well-tolerated direct-acting antivirals offers the opportunity to expand hepatitis C treatment beyond liver disease specialists. Mathematical models – and early real-world evidence – suggest that providing treatment for enough people could eliminate hepatitis C as a public health threat. As one of the highest-risk groups, people who inject drugs are key to this effort. Drug consumption rooms, known in some countries as supervised injection facilities, allow people to use drugs under the watch of trained staff, who can administer naloxone (Narcan) if needed to reverse opioid overdoses. They provide sterile syringes and other equipment, preventing transmission of HIV, HBV and HCV. They reduce street-based drug use and improper syringe disposal, as well as offering clients an entry point for seeking addiction treatment and medical care. Supervised consumption sites tend to serve the most vulnerable people who inject drugs, including those facing mental health issues and homelessness. Research has shown that they reduce risk behaviour and harms associated with drug use including overdose and infectious disease transmission. There are currently around 100 drug consumption rooms around the world, most of them in Europe. Amsterdam was among the cities that pioneered the concept in the 1980s. Australia has a supervised injecting centre in Sydney and is trying to open another in Melbourne. Vancouver's Insite, the first North American facility, served more than 7300 clients in 2017. Several cities are currently vying to open the first supervised consumption site in the United States, including San Francisco, New York, Philadelphia and Seattle. Despite the large number of people who inject drugs in London and elsewhere, the UK currently has no drug consumption rooms. Eberhard Schatz of De Regenboog Groep in Amsterdam presented findings from a study looking at what kinds of hepatitis C testing, treatment and other health and support services are provided by drug consumption facilities. This information was gathered using an online survey. Among the participating sites, 67% were run by non-profit organisations, 40% by governments, 7% by private parties and one by a church. Funding mostly came from local or municipal sources (71%), followed by state or regional sources (36%) and national governments (13%). A majority of consumption rooms (57%) were co-located with other services used by people who inject drugs, 30% were stand-alone facilities and 20% were mobile operations. The average number of visits per day was 80 and on average the sites had 12 stations or booths for drug consumption. A majority of clients used them to inject drugs, but some also smoked, inhaled or snorted drugs. The consumption rooms had an average of seven paid and one unpaid or volunteer staff on site during a typical day. Eighty per cent employed nurses, 78% included social workers, 44% had onsite medical doctors, 28% had health educators and 22% included paid peer counsellors. Almost all the consumption sites offered syringe distribution, condoms and referrals for health services, drug addiction treatment or other care. A quarter offered onsite opioid substitution therapy (OST, usually methadone or buprenorphine), while 70% referred clients elsewhere for OST. Most (89%) provided onsite overdose management, though 26% did outside referrals for this; 37% provided naloxone to take away. Two-thirds of the sites offered onsite HCV testing and pre- and post-test counselling. Most provided brochures, counselling or other hepatitis education resources. An estimated 80% of clients received testing and 60% were found to be HCV-positive (median across sites). Just over half (54%) offered HIV testing. A quarter of the sites offered liver health monitoring such as fibrosis blood tests or FibroScan, and an additional 11% planned to do so. However, just two sites (4%) provided hepatitis C treatment onsite and only one other planned to do so. Ten programmes either currently offered or planned to offer treatment offsite. Sites that employed nurse or doctors and those that offered OST were more likely to provide onsite hepatitis C medical management. Looking at other services, half of the sites offered support for health self-management (around healthy diet, obesity, etc.) and 44% offered mental health care. Most sites offered coffee or a tea and a place for clients to charge their phones, while 78% provided personal care facilities such as showers and laundry. Asked how they would increase capacity given additional funding for HCV-related services, just over half said they would hire more staff, 46% would offer more staff training, 41% would fund educational materials, 26% would employ peer support workers and 24% would develop referral pathways. One programme indicated they would buy a FibroScan machine. Drug consumption rooms or supervised injection facilities "provide a broad range of social and health services in safe environment for people who inject drugs," and some already offer HCV-related services, the researchers concluded. "Additional financial resources for qualified staff and capacity building are essential to enhance the capacity for HCV services," they added. These facilities "should be considered as a low-threshold HCV treatment provider for people who inject drugs on the community level; innovative arrangements should be sought." Schatz E et al. Study on drug consumption rooms on current practice and future capacity to address communicable diseases like HCV. 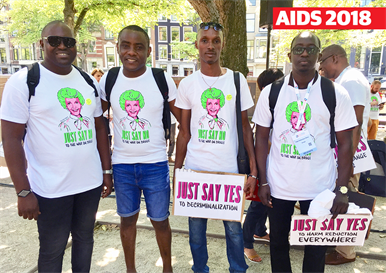 22nd International AIDS Conference, Amsterdam, abstract TUAD0101, 2018.